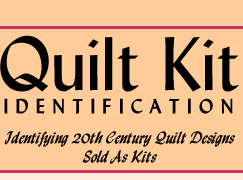 Does QUILT KIT IDENTIFICATION disclose or share my personal information with anyone else? Quilt Kit Identification will use your personal information to provide you with all of its services, including processing orders and other transactions. We do not disclose your personal information to any outside companies period! Does QUILT KIT IDENTIFICATION use "cookies"? Only to store session data, never for passwords or personal information.